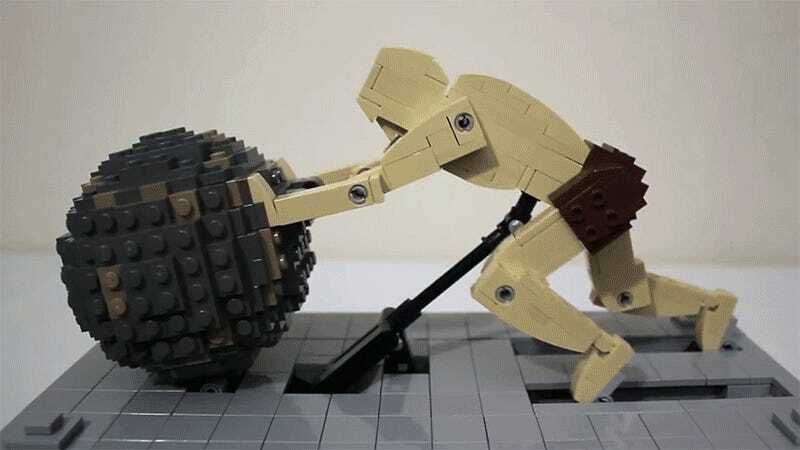 Inspired by a Disney Research project that automatically calculates all the gears and mechanical links needed to create realistic motion in an animated figure, Jason Allemann of JK Brickworks created this incredibly lifelike kinetic sculpture of the tragic Greek figure, Sisyphus, using Lego. The former king of Ephyra, Sisyphus was ultimately punished for his self-aggrandizing and deceitfulness by having to roll a giant boulder up a hill for eternity, only to have it come rolling back down again and again. Allemann’s kinetic sculpture does an absolutely bang-on job of making his Lego version of Sisyphus look like he’s genuinely struggling against the weight of pushing that giant boulder.